TBI Field School Students began a study of fossil preparation on Tuesday, in an effort to better understand the process by which fossil remains are made ready for scientific analysis.We are accustomed to seeing pictures of beautifully preserved fossil crania on the covers of Science, Nature or National Geographic. Most fossils are not found intact however, and require hours of cleaning, consolidation and reconstruction. 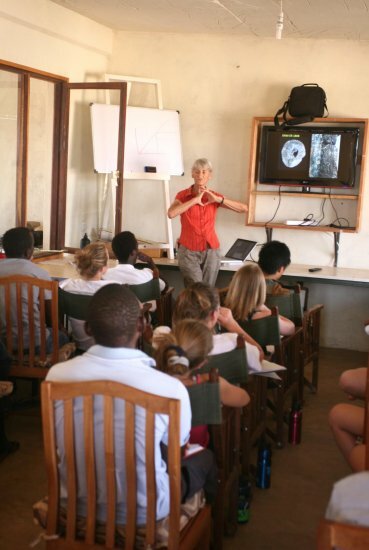 Richard and Meave Leakey, with Cara Roure Johnson and TBI staff, instructed students on basic fossil preparation techniques using TBI’s laboratory facilities. TBI Field School Students began a study of fossil preparation on Tuesday, in an effort to better understand the process by which fossil remains are made ready for scientific analysis. We are accustomed to seeing pictures of beautifully preserved fossil crania on the covers of Science, Nature or National Geographic. Most fossils are not found intact however, and require hours of cleaning, consolidation and reconstruction. 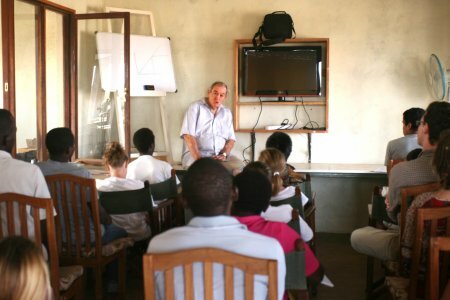 Richard and Meave Leakey, with Cara Roure Johnson and TBI staff, instructed students on basic fossil preparation techniques using TBI’s laboratory facilities. 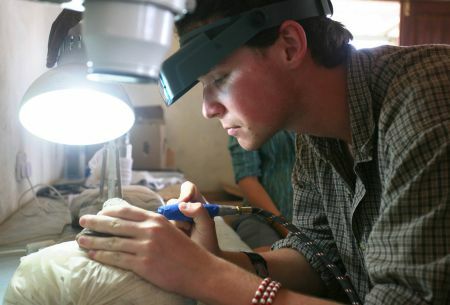 Benjamin Smith slowly airscribes a fossil dinosaur from sandstone. 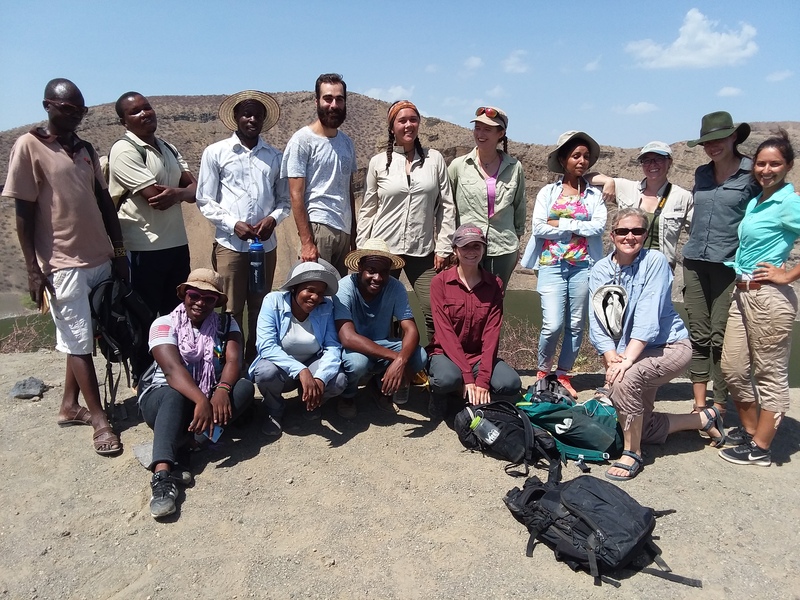 Turkana Basin Institute Field School students began their work on Tuesday morning with lectures by Richard and Meave Leakey, who spoke on the importance of fossil finds within a broader evolutionary context. Richard, after recounting the history of the Nariokotome discovery, stressed that our understanding of all fossil bones is contingent upon a larger ecological and paleontological context of discovery. Just as importantly, our understanding is shaped by the philosophical framework by which our inquiry is motivated. 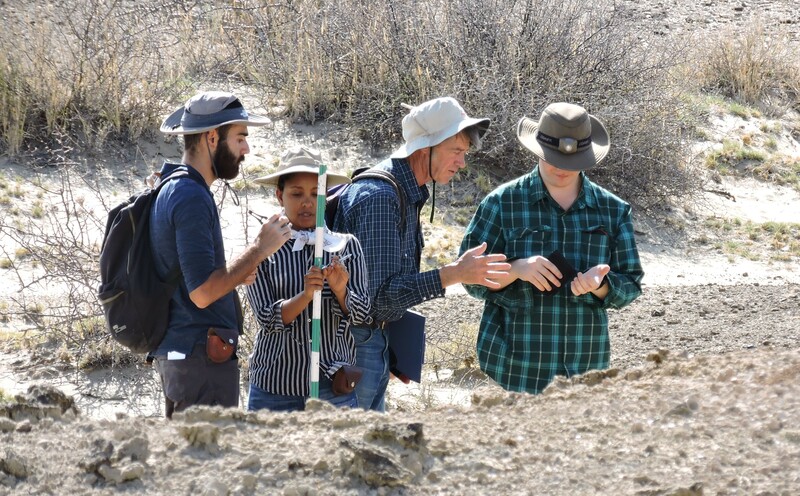 Meave then reviewed the history of laboratory preparation underlying each of the famous fossil finds taught by instructor Cara Roure Johnson over the last two weeks. Following these introductions, students headed into the laboratories to begin learning fossil preparation techniques themselves. RIchard Leakey places the discovery of Nariokotome Boy within the broader context of human evolution. 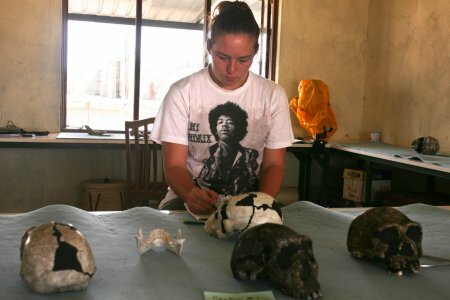 “Fossil hominids are said to have a voice,” Richard recalled having heard among other paleontologists, “because fossils sound different than rocks when prodded with dental picks.” Nariokotome Boy, the 1.6 million year old Homo erectus from west of Lake Turkana, helped revolutionize our understanding of human evolution in East Africa after its discovery 35 years ago. Scientists still marvel at the long limbs, tall stature and large brain of this juvenile individual who, in many ways, resembles a modern human being. 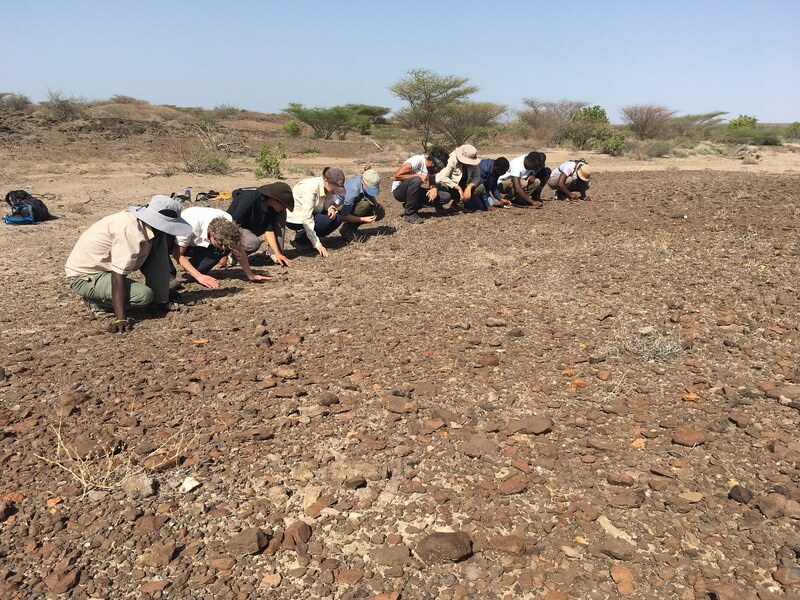 Meave Leakey reviews the history of fossil discovery and laboratory preparation at Lake Turkana. Meave and Richard took care to place the project of fossil discovery and analysis within the greater Renaissance and Enlightenment traditions of questioning our identities, purposes and origins using scientific methods. Sonia sketches the cranium of KNM-WT 15000, also known as Nariokotome Boy, in the TBI labs. Cara Roure Johnson, in preparation for each of her lectures, made casts of major finds available to students for study. John Mark adjusts the light for Mary as she begins working with her airscribe. 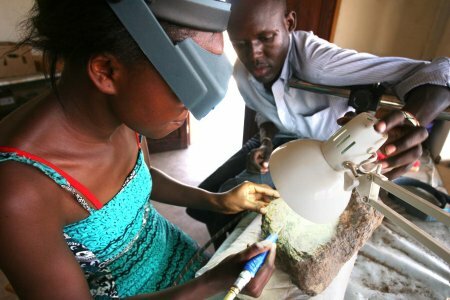 Fossil preparators John Mark Ekeno and Tony Moru helped train TBI Field School students in the basic methods of fossil cleaning using drills called airscribes. After fossils are brought in from the field, carefully recorded and accesssioned, they are then ready for laboratory cleaning. Peter uses an airscribe to break sandstone and pebbles from a dinosaur fossil. Airscribes are small, pneumatic drills: piston points driven back and forth at high velocities through the use of air pressure. Preparators use microscopes or magnifying glasses to better view their scribes and fossils as they work. Alisha airscribes away the last layers of sandstone from a smaller fossil with great care. The airscribes fracture sandstones and pebbles but, if the researcher is careful, preserves intact the fossil underneath them. 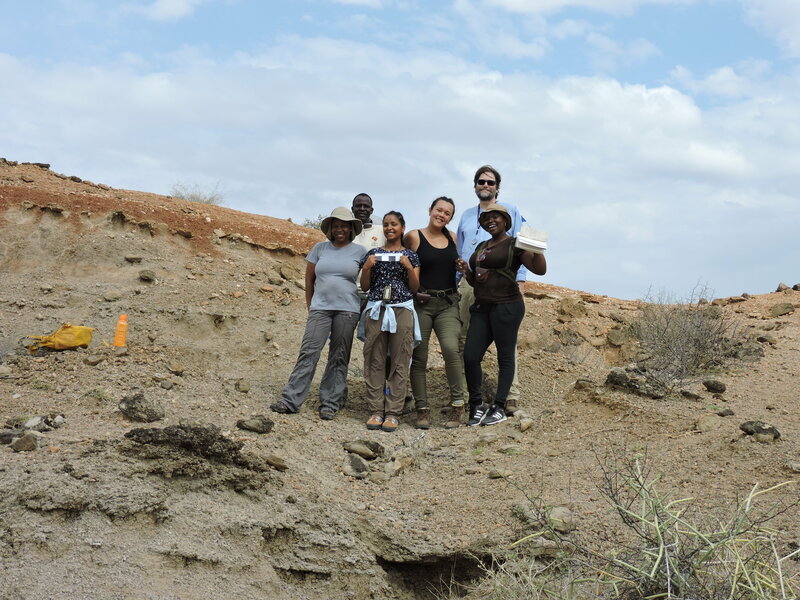 Meave Leakey helps Kelly, Alec, Sonia, Peter, Ben and Meadow understand the principles behind laboratory fossil preparation. 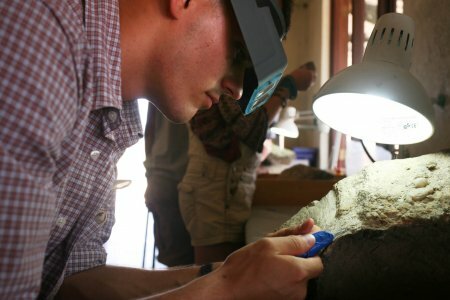 The fossils cleaned by TBI students belonged, 95 million years ago, to a Titanosaur, a class of the world’s largest creatures ever to roam the earth. These dinosaurs, a form of Sauropod, ranged over every continent with the exception of Antarctica, feeding on grasses and palms in what was once a Gondwana supercontinent. 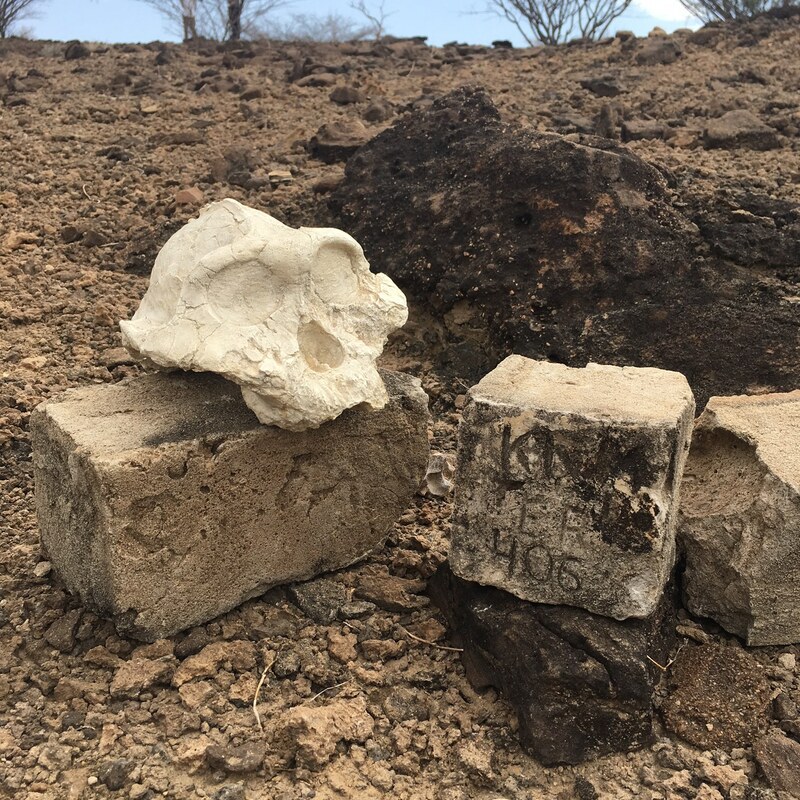 These Titanosaurs were buried nearby, in the Lapur mountains north of TBI and west of Lake Turkana. They were fossilized within sandstone, siltstone and mudstone sediments almost half a kilometer thick, presumably part of a massive, ancient fluvial and lacustrine system that supported them. Still deeper beneath these sediments lies Cambrian basement rock over 500 million years old.